Actor Ram Charan poses for a photo as he leaves the Sudarshan theater after watching Rangasthalam movie. The most awaited Telugu movie Rangasthalam has released worldwide on March 30, 2018 and is running in theaters successfully with a high positive talk. Actor Ram Charan poses with his fans at Sudarshan Theatre 35MM 4K & Dolby Atmos, RTC X Roads in Hyderabad on March 30, 2018. 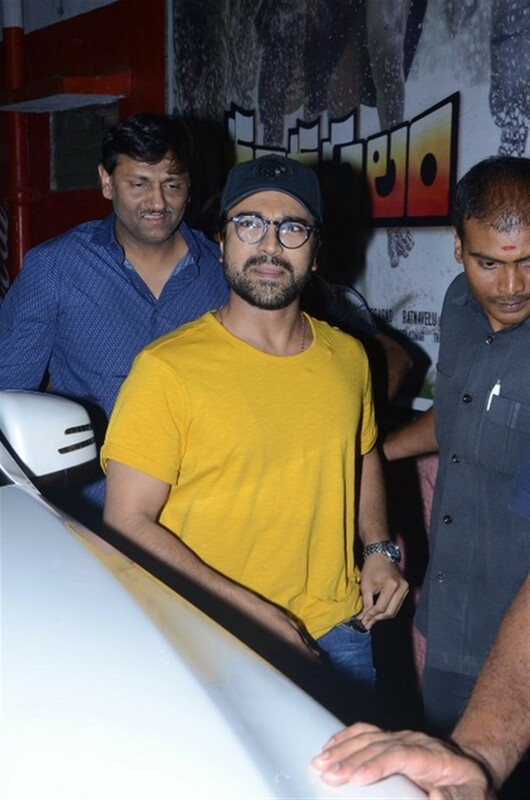 South Indian actor Ram Charan watches Rangasthalam movie with fans at Sudarshan theatre in Hyderabad. Actor Ram Charan has watched the movie at Sudarshan theatre and observed the audiences' reaction.